From the first day in Delhi, we move on to travel to Kalka with the destination of Shimla in mind. Toy Train travel was expected to be one of the greatest experiences of our North India tour with family and it turned out to be so. The main article – Discover India – North India Tour with family. 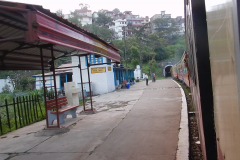 Next in our Travel itinerary was to go to Kalka to catch the train to the famed Hill Station of Shimla. Interesting part was the Toy Train journey from Kalka to Shimla which is one of the most sought after from tourists going to Shimla. The train was leaving the NDLS (New Delhi Railway Station) at 5 PM and reach Kalka at around 10 PM. After the lunch at the Carol Bagh, it was already around 2 PM and we then headed off to the railway station. “Kalka is a town in the Panchkula district of Haryana, India. The name of this town is derived from the goddess Kali. The town is situated in the foothills of the Himalayas and is a gateway to the neighbouring state of Himachal Pradesh.” – Wikipedia. We reached Kalka by 10 PM by Delhi Kalka Shatabdi on our first train journey as part of the Discover India tour. After arriving at Kalka, we left for the already booked nearby hotel. Hotel was quite close to the railway station. The booking on the IRCTC for Toy Trains are only possible 30 days prior and though I tried on almost the same day the booking opened, all the trains at convenient timings were not available. I believe these trains are so highly sort after by the tourists to Shimla, they get booked the instant the bookings open. The regular train bookings are possible on Indian Railways, 90 days prior. The name of this particular toy Train was ‘52457/KLK SML PASS’. There are several trains plying the route to Shimla. However, getting a booking done in these trains need not be easy. Train was leaving Kalka at 3.30 AM. That was an odd time and we hardly slept for three hours as we had to leave soon after reaching. In the morning, Joshina started complaining of uneasy health and we tried to get a black tea done. So early in the morning, it wasn’t easy to get the hotel staff to start working. I had to pull a boy out of sleep and due to this we had hardly any time left to leave on time to the railway station. Finally, when we ran into the platform, the train was jam packed. 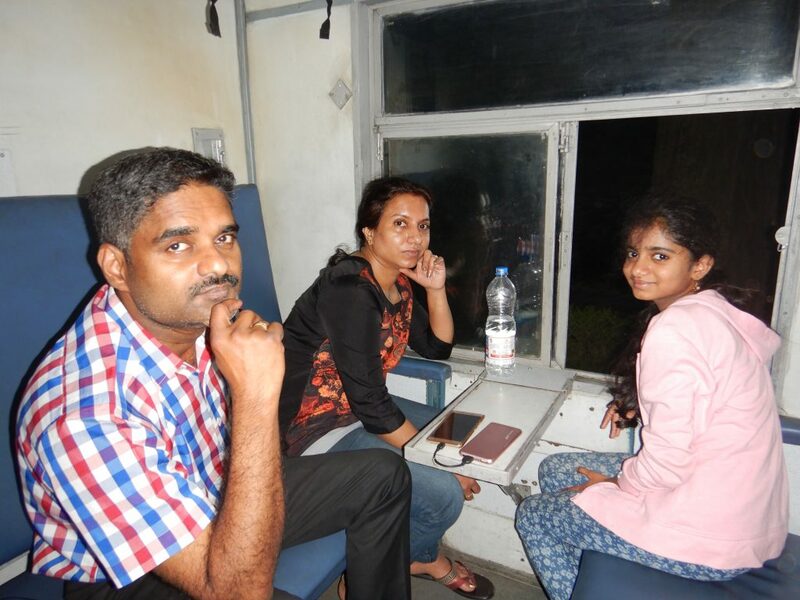 We had a reservation in the first class, the only reservation that was available in the only train which I hurriedly booked at the time of booking, almost a month before. With the train jam packed we ran to find the first class. First class was not a coach. It was just part of the coach and consisted two long seats against each other. After all the running into find our reserved first class, the seats were gone. It was already full. I was already suffocating from the early morning marathon inside the station, finding our reserved compartment full, I was shocked, and every other compartment was full also. Hence getting into an ordinary compartment was out of the question. Luckily for us, there was a TTE standing outside already asking the passengers who were apparently young boys and a family to get out after finding out that they had no reservation. We waited in the platform for several minutes. We felt guilty that the TTE was sending the passengers out to make way for us. But we also had no other option. There are only few such narrow-gauge mountain trains in India which are still plying. 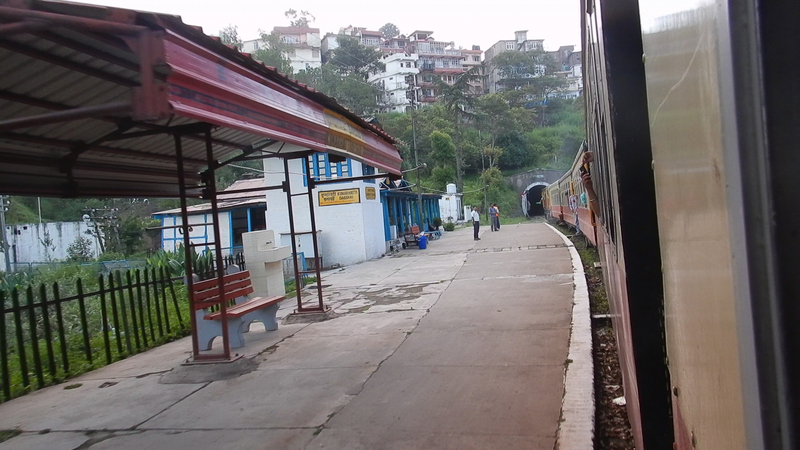 One is in Darjeeling (West Bengal), Ooty in Southern India, and this one between Kalka and Shimla besides any others. “Shimla became the summer capital of British India in 1864 and was the headquarters of the Indian army. This meant that twice a year it was necessary to transfer the entire government between Calcutta (then British India capital) and Shimla by horse and ox drawn carts” – Wikipedia. The Shimla mountain rail was constructed between 1855 and 1913 by the British. Only if you travel in it you will marvel how British engineers who must have been supported by a large force of Indian workers completed such a complex engineering work so long back when hardly any modern logistic support, equipment and engineering solutions existed. The below documentary on the YouTube captures of the essence of this great railway. As we started the journey from Kalka station it was 3.40 AM. There was hardly any visibility at that time. An hour later, Sun begun to rise and the beauty of the nature surrounding us and the special train became obvious. 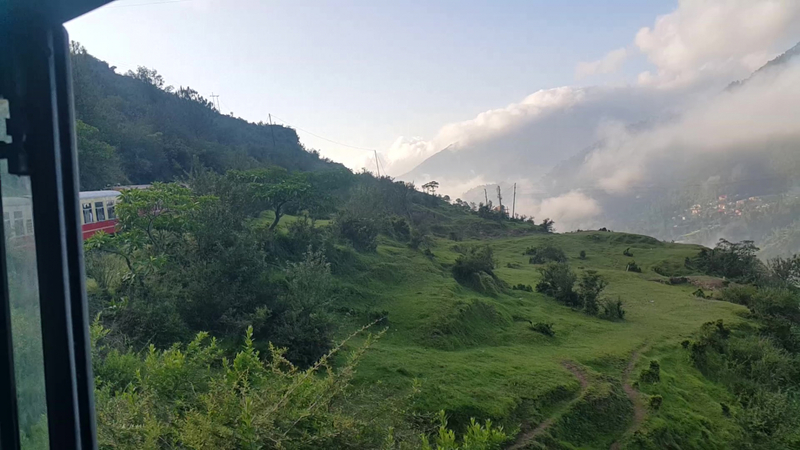 This train traverses through the hills that have thick green vegetation all around you, mountain on your one side and the valley on the other side. The train itself, is fun to watch and it traverses more than hundred tunnels and several curves and archaic looking but well-built bridges. Railway stations are another fun to watch as they are unlike any normal station you might have seen. Toy train compartment itself is small and hence do not expect the larger space you would find in a normal train. I somehow felt booking the first class isolated us from being part of a larger group of passengers that would have been the case in a regular Toy train boggy. But the fact is, all seats were full at such an early hour and if we had no booking, we probably couldn’t have boarded the train at all. If you love the train journeys, if you love nature, do not miss this journey by the Shimla Toy Train. Without any doubt, it is a lot of fun. Overall it was one of the best experiences in our North Indian tour of several destinations. Try to book a train leaving Kalka at around 9 AM. The time we were forced to choose was not a very convenient one. 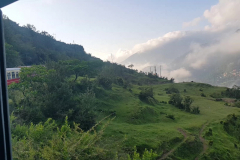 But that enabled us to see the dawn on the hills and the blue color that enveloped the greenish hills as the Sun rose. My fellow passengers, wife and children, were asleep some of the time, due to lack of overnight sleep. I wanted the children to look at the nature throughout. But these days, in the era of smart phones it is hard to get someone’s undivided attention for too long. The below linked videos were taken during our journey and hope that it will help you see the journey more closely and vividly. Apologies for the occasional rumbling from the family.